Student activists, working with information gathered through Freedom of Information (FOI) requests, have ranked Cambridge University’s thirty-one colleges in order of favourable employment practices. The table, dubbed ‘Taylor’s Table’ after a fellow at Trinity College, who in 1907 gave £500 to pay for the dental inspection of every schoolchild in the city, creates a points system based on three criteria. First, the lowest hourly wage paid to staff (including ‘casual’ workers) above the age of 18. The highest paying college is Queens’, the only college currently accredited by the Living Wage Foundation, which paid a minimum of £9.08 an hour excluding holiday pay. The current median hourly salary in the UK is around £11.31. The lowest was Churchill, paying a minimum £6.80 hourly. The table also includes the number and percentage of staff paid less than the Real Living Wage which, at the time of data collection (August 2018), stood at £8.75. Nearly a quarter of colleges do not pay any staff below this figure, while Robinson paid 128 staff below. This amounts to nearly 59% of non-academic, non-administrative workers at the College. The Real Living Wage now stands at £10.55 in London, and £9 elsewhere. However, the average monthly rent for a two bedroom property in Cambridge is over one and a half times the cost in the rest of England, leading to calls for a specific Cambridge Living Wage to be adopted. 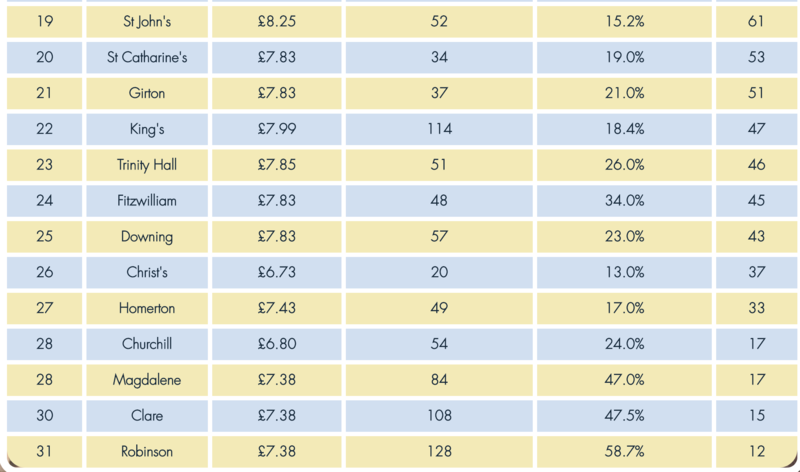 Data on wage payments was combined to create a total ranking, placing Queens’, Trinity, and Sidney Sussex in the top three, with Magdalene, Clare and Robinson coming bottom. The table was compiled by Joe Cook and Abdullah Shah, creators of a well-received documentary about inequality in Cambridge entitled ‘A Choice to Look’, which was released in July. Work on the table began the same month, involving individual FOIs to each college in order to compile a comprehensive ranking. In further comments, Cook and Shah lambasted the practices of some colleges as “exploitation”, and expressed a hope that the rankings will accelerate calls for change. Daniel Zeichner MP was among those to welcome the transparency: “I congratulate campaigners for digging out this important information, and urge colleges to look closely at their employment practices to make sure that their low-paid staff are getting a fair deal”. Meanwhile, CUSU’s Evie Aspinall said that she finds it “incredibly disappointing” that colleges consistently fail to pay their staff the Real Living Wage. 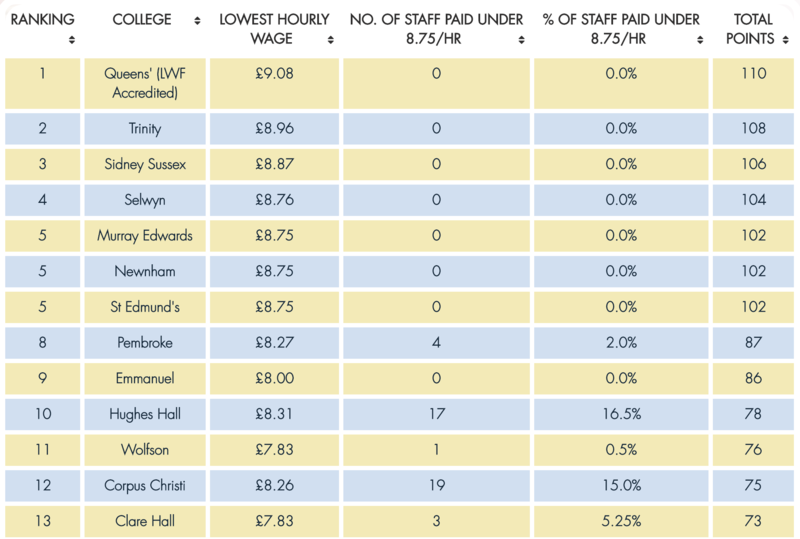 The table reveals that only eight colleges paid all their staff above £8.75, compared with the eleven Oxford colleges signed up to the Living Wage Foundation scheme. The University as a whole has committed to paying all direct employees the Real Living Wage, however this does not extend to the thousands of workers employed across the colleges.